This warming soup gets a nice creamy texture if you make it with pureed tomatoes and a splash of cream. I make mine with my homegrown tomatoes. It almost tastes like summer! 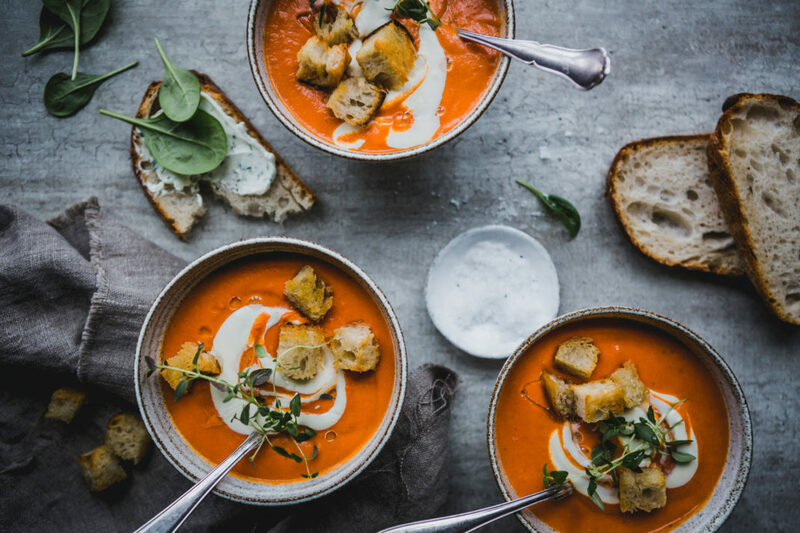 This warming tomato soup is the perfect dish for anyone who has plenty of pureed tomatoes in their freezer, or some tomato sauce left from the summer harvest. Finely chop garlic and yellow onion on low heat until the onion is soft. Use the same pot that you will cook your soup in. Pour the pureed tomatoes (or fresh, halved tomatoes) into the pot and let the mix boil. Fresh tomatoes take longer to cook. You could blend the fresh tomatoes and dilute the mix with water if necessary. Add a splash of cream, some honey and season with herbal salt. Serve with creme fraiche, fresh herbs, croutons and a nice cheese sandwich.